The year was 1858. The place was Turin, Italy. 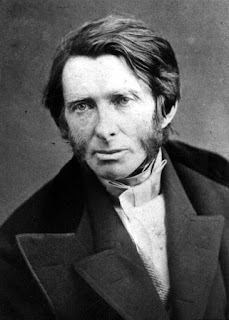 The person was John Ruskin, the great evangelical art historian and social reformer – but he was not to be evangelical for long. Ruskin’s evangelical formation is what causes to the Bible to be referenced in almost every page of his voluminous works. But exposure to higher biblical criticism and studies in geology threatened that youthful faith. The most effective threat, however, came from his aesthetic education. Ruskin’s travel with his family to Europe, especially Venice, inaugurated what we might call (riffing on Mark Noll’s publication) the scandal of the evangelical eye. Imagine the scene for a moment: Ruskin bathes in aesthetic glory on a Sunday morning before Veronese’s cataract of color. He is amazed at the artist’s God given power. But, it being Sunday morning, he reluctantly extracts himself to fulfill his Sabbath obligation, which – of course – means attending a Protestant church. However, the Waldensians (a proto-Protestant sect was the best Ruskin could do) were so aesthetically barren, and the sermon so hopelessly narrow, that the contrast between Ruskin’s art experience and his formally “religious” one is unbearable. The only way that Ruskin could protest that soul-crushing disjunction is to renounce evangelicalism. He called it his “unconversion.” Which is to say, his eyes outgrew his soul. To be sure, as Michael Wheeler’s Ruskin’s God persuasively argues, it was too late for Ruskin. He could not neatly “unconvert” because his evangelicalism was too deeply rooted. Wheeler sees too many references to faith in the later Ruskin, and the leitmotif of Ruskin’s lifelong faith, furthermore, is the Biblical glory of Solomon, as reflected by Veronese. We might also add that Turin is an ironic place for an aesthetic unconversion, it being the city that hosts the ultimate warrant for aesthetic practice: The Shroud of Turin, a proto-photographic replica of the face of infinitude itself. But for Ruskin, the Shroud must have been too Catholic. “Whoever loves beauty,” lamented the Protestant theologian Gerhard Nebel, “will, like Winckelmann, freeze in the barns of the Reformation and go over to Rome.” But Ruskin’s evangelicalism had instilled in him a virulent strain of anti-Catholicism. Love of beauty therefore doomed Ruskin to theological and aesthetic limbo: Too visually sophisticated to be evangelical, and too suspicious of Popery to be Catholic. New directions of research emerge when one goes to the art historical record not to defect because of a perceived inadequacy (as with John Ruskin), or to artificially prove the differences among the traditions (as with Pavel Florensky), but to lovingly respect one’s own tradition, to abide within it (as with John Walford), but also to joyfully indicate commonalities when they appear. Just as there is, according to our Bibles, “one Lord, one faith, one baptism,” so perhaps there is also one variegated yet unified Christian aesthetic, to which the different traditions, at their utter best, ascend. Full maturity (which for evangelicals has been a long time coming!) is not to see with Protestant, Orthodox or Catholic eyes - but with the eyes of Christ. Good news for me is you can't effectively disagree until you hear my entire case by reading the whole thing.